Here is a story worth sharing. We often speak of the universe being a reflection of ourselves, and point to how the eye, veins, and brain cells mirror visual phenomenon in the universe. As above so below right? Well check this out. How about the idea that the universe is a giant brain? The idea of the universe as a ‘giant brain’ has been proposed by scientists and science fiction writers for decades, but now physicists say there may be some evidence that it’s actually true (in a sense). According to a study published in Nature’s Scientific Reports, the universe may be growing in the same way as a giant brain – with the electrical firing between brain cells ‘mirrored’ by the shape of expanding galaxies. The results of a computer simulation suggest that “natural growth dynamics” – the way that systems evolve – are the same for different kinds of networks – whether its the internet, the human brain or the universe as a whole. When the team compared the universe’s history with growth of social networks and brain circuits, they found all the networks expanded in similar ways: They balanced links between similar nodes with ones that already had many connections. For instance, a cat lover surfing the Internet may visit mega-sites such as Google or Yahoo, but will also browse cat fancier websites or YouTube kitten videos. In the same way, neighboring brain cells like to connect, but neurons also link to such “Google brain cells” that are hooked up to loads of other brain cells. “The new study suggests a single fundamental law of nature may govern these networks”, said physicist Kevin Bassler of the University of Houston. “”For a physicist it’s an immediate signal that there is some missing understanding of how nature works,” says Dmitri Krioukov from the University of California San Diego. So this may seem weird, but let’s think about this. We always talk about consciousness being the underlying fabric of the universe from which all things emerge (M-theory, string theory, Unified Field Theory, etc). Consciousness is known to be the ground of being. So not only is the universe conscious like a brain, it is growing like a brain as well. But here’s a question…a brain to what? Is it possible we exist as a thought within the mind of some Super Intelligence? 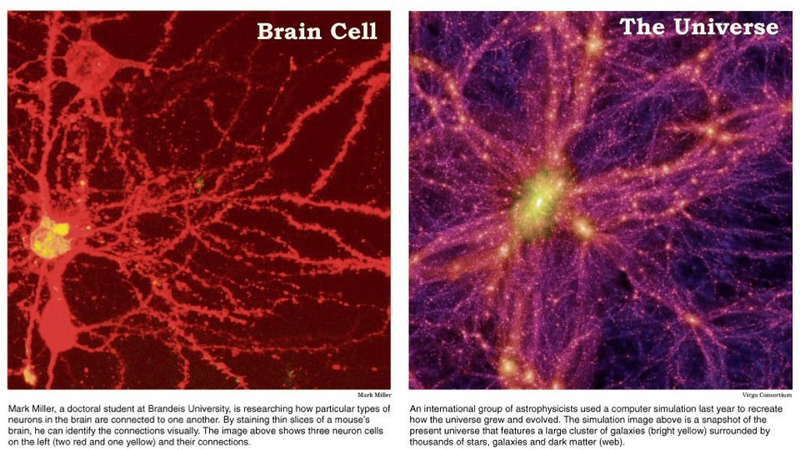 Are we just cells in the mind of the Universe? Maybe, maybe not, but it’s fascinating to think about.